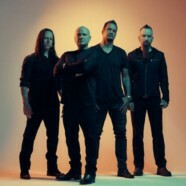 Disturbed will unleash their seventh full-length album, Evolution [Reprise Records], on October 19. The pre-order goes live at all digital retailers today with special D2C packages available on the band’s official website and features lead single “Are You Ready” as an instant download. Click HERE to watch the “Are You Ready” video directed by Roboshobo and pre-order Evolution HERE. Evolution arrives in the wake of the group’s 2015 full-length Immortalized, which became their fifth consecutive #1 debut on the Billboard Top 200, earned a platinum certification, and yielded the triple-platinum crossover smash “The Sound of Silence.” The latter received a nomination at the 2017 GRAMMY® Awards for “Best Rock Performance.” Additionally, they took home “Best Rock Artist” at the iHeartRadioMusic Awards and received acclaim from The Wall Street Journal, New York Times, USA Today, and more.